I'm keeping things short and sweet today, folks. There's a ton of work piling up and instead of getting it done, I'm here slackin' off. But, heck, sometimes we need to play a little, right? I'm currently in the middle of a cookbook shoot and I have some other fun projects coming up, including an iPhone food photography class I'm teaching next week at a local Whole Foods. I've taught one on one classes before, but this is going to be quite different. Actually, I'm really excited about it. We're starting off the class by going around the store, taking pictures of the various produce, cheese, and fish displays. From there, we're going to do have a little cooking class and, as we prepare each dish, I'll go over some ways to style and shoot the food. So, yeah, I'm feeling a little overwhelmed by things, but I didn't want all of this to stop me from posting. I've had mint pesto on my mind a lot recently. I first had it at a restaurant years ago and my mind was blown by how refreshing it was and how wonderfully it paired with other spring produce, like asparagus. 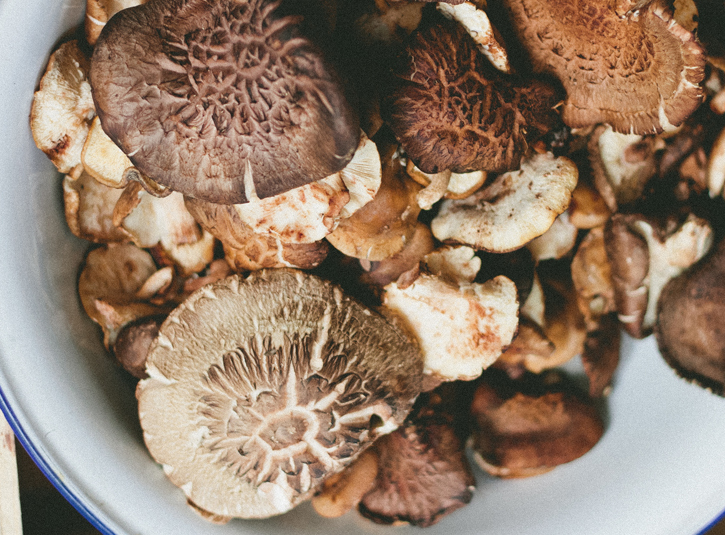 Here, I've tossed it up into a big pasta dish and have included one of my other favorite seasonal ingredients... mushrooms. Enjoy! Put a pot of salted water on the stove and bring to a boil. Cook the pasta as directed on the box. While it is cooking, prepare the pesto. You can do this in a food processor, but I like doing it by hand, so as to not turn the pesto into mush. To do it by hand, place the garlic clove on a large cutting board and add 1/3 of the mint leaves on top of that. Using a large chef's knife, chop the leaves and the garlic. Once it is finely chopped, add another 1/3 of mint leaves and continue chopping. Repeat with the remaining mint. Once this is done, add the chopped almonds on top and chop until they are incorporated into the pesto. Add the cheese on top and chop and fold into pesto mixture to combine. Add this mixture to a bowl and stir in 1/4 cup olive oil. Set aside. At this point, the pasta should be finished cooking. Drain and let cool as you cook the asparagus and mushrooms. In a medium skillet, heat 1 tablespoon of olive oil over medium-high heat. Add the mushrooms to the pan and let cook for a minute. Add in the asparagus and season with salt and pepper. Cook for an additional 2-3 minutes, or until the asparagus is bright green and, when you taste a pieces, it remains slightly crunchy. In a large serving bowl, toss the pasta with the pesto, making sure to coat each piece evenly. 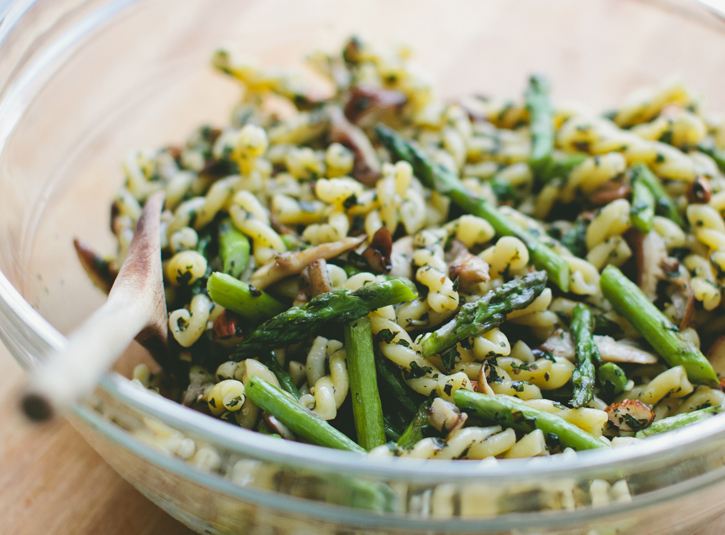 Mix in the mushrooms, asparagus, and lemon zest. Taste for seasoning and, if necessary, add additional salt and pepper.